The ultimate wagon for childminder! As a childminder you often get to deal with varying numbers and ages of children. The Rambler wagon offers this flexibility with various accessories that you can combine. With the duo-baby seat and child seat you have several options from infant to toddler. 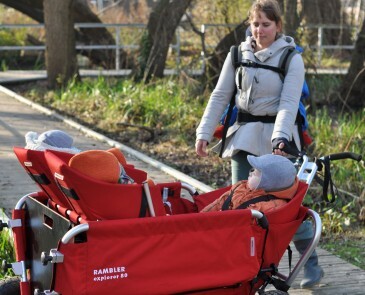 The Explorer 65 and Explorer 80 are the most used wagons by childminders. These offer many combination possibilities with the duo-baby seat and child seat. Children from approximately 1.5 years can sit on the benches. There also fits a child seat on the front for one child up to about 3 years. The rear entrance can be closed with the back board, which is supplied with each Explorer 65, 80 and 120. Wagon up to 5 children.